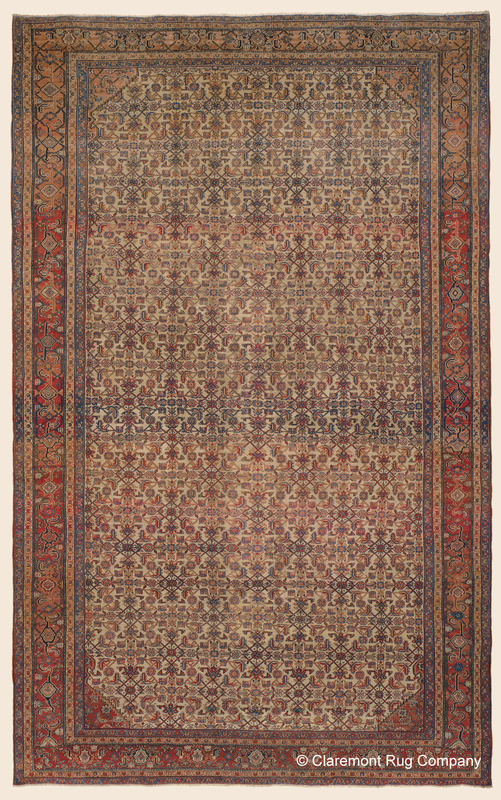 Search Our Inventory / All Rugs / 11&apos; 2" x 17&apos; 10"
11&apos; 2" x 17&apos; 10"
(High-Decorative) A petit point, extremely well executed use of the classical, all-over Herati design offers opportunity for infinite exploration and discovery in this exceptionally versatile, oversize Sultanabad carpet. Its seldom encountered, avidly desired over 17-foot length is equally ideal in a grand foyer, contemplative library, or beneath the full length of a formal dining table. In every context, viewers will immediately be drawn with rapt attention to the way each frond and facet is crafted individually, then animated with masterful use of the intentional color-shading technique known as abrash throughout its profoundly harmonious earth tones. The periodic use of stripe of richer brick red serve add an additional layer of texture and intrigue. Because this level of dexterity and aliveness is never seen in younger Persian carpets, fine 19th century Sultanabads such as this are greatly appreciated by sophisticated audiences.